On Sunday, April 8, when Ukraine was celebrating Easter, parliamentary elections in neighboring Hungary took place. The ruling conservative Fides Party of Prime Minister Viktor Orban, its younger partner in the coalition Christian Democratic People's Party of Zsolt Semjen, the far right party Jobbik of Gabor Vona, and political forces of the liberal democratic camp (Hungarian Socialist Party of Ferenc Gyurcsany," Democratic coalition "of Gergely Karacsony, Democratic coalition of former Prime Minister Ferenc Gyurcsany, Momentum Movement of Andras Fekete-Gyor, Green Party “Politics Can Be Different” of economist Bernadett Szel) – all these forces were struggling for the seats in the Hungarian parliament. Opinion polls predict Orban’s victory; he intends to become the Hungarian prime minister for the fourth time. At the same time, against the background of the migration crisis, the popularity of the "Jobbik" party, which does not hide the support of Russia's aggression in Ukraine, is growing. 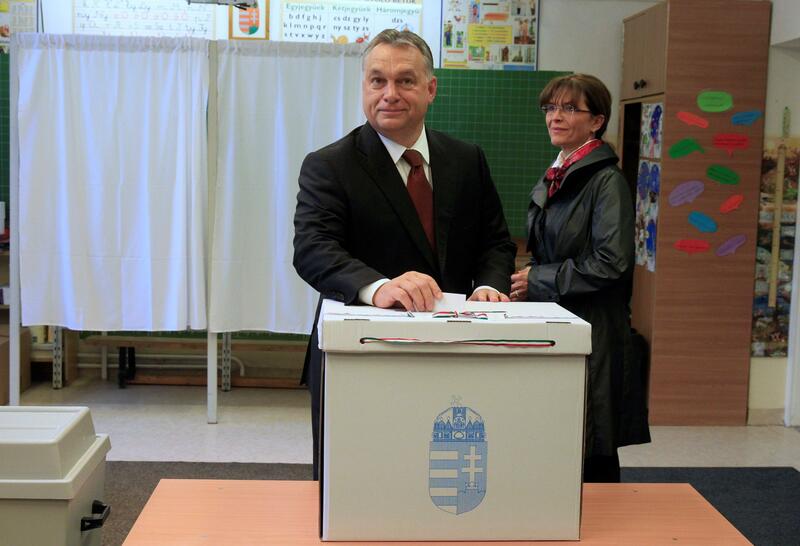 The outcome of the parliamentary elections in Hungary is quite important for Ukraine. Relations between our states have been not simple throughout the history and are now complicated by the language issue, the paternalistic policy of Budapest towards the Hungarian minority in Transcarpathia, and the territorial claims of the far right radicals, who are seeking to make their way into the Government. According to opinion polls, the alliance of the ruling political forces "Fidesz" and "Christian Democratic People's Party" is a favorite in the pre-election race. 49% of voters were ready to vote for them. The key pre-election message of Orban is the opposition to the EU's open door policy. The Hungarian prime minister presents refugees and migrants professing Islam as a threat to the identity of Hungary. A week before the election, Orban intensified criticism of George Soros, an American billionaire of Hungarian descent and founder of the fund of the same name. Orban considers Soros "the number one enemy of Hungary", presents him as a conductor of Brussels influence, and the sponsor of the liberal-democratic opposition. In one of his recent statements, Orban claimed that there were allegedly about 2,000 people in Hungary, who during the election campaign were trying to overthrow the government and to create a favorable regime for Soros. And it could turn Hungary into a country of migrants. It is no coincidence that the leader of the Fidesz Party uses populism, anti-immigrant, and anti-European rhetoric. Most Hungarians really oppose the deployment of 1,294 refugees by quota in accordance with the plan of the European Commission. According to a survey of the Pew research center, 76% of Hungarian respondents believe that sheltering refugees is equivalent to a terrorist threat. In 2015, the territory of Hungary was crossed by 400 thousand descendants from the countries of Asia and Africa, who traveled to Western Europe. Hungarians fear that Muslim refugees will cause the growth of terrorist threat and ethno-religious conflicts. The systematic attacks of Islamic extremists in the UK, France, Germany, the countries of Southern and Northern Europe, and cases of violence by refugees against Europeans produce an oppressive impression on the Hungarians. Hungarians are worried that similar problems might affect their country. The attitude of the Hungarian society towards Muslim refugees reflects the case in Ocseny (autumn of 2017). The owner of the local hotel Zoltan Fenyvesi expressed the desire to shelter a group of refugees and thus demonstrate Hungarian hospitality. This aroused the indignation of a significant number of villagers who rallied near his hotel. Fenyvesi received threats and was condemned for his cooperation with the organization "Assistance to Migrants". Regardless of party convictions, a significant number of Hungarians are opposed to the deployment of refugees on their territory and are ready to resist the policy of "open doors". Orban uses anti-immigrant sentiments in society in his favor and develops the image of the defender of the Hungarian people against the arbitrariness of European bureaucrats and the threat of Islamization. During the current cadence, he actually proved that he was ready to take radical measures to prevent the influx of refugees to Hungary. They built special fences along the state border with Serbia and Croatia, staffed with video surveillance, which can withstand the influx of large crowds of refugees. The Hungarian military patrols the border areas for the timely detention of refugees with subsequent deportation. Orban is supported by a wide range of people, including people with higher than average income. The Hungarian oligarch with a fortune of 327 million euros and the mayor of Felcsut village Lorinc Meszaros is a member of Fidesz. And this case is not rare. During Orban’s rule, economic growth is visible in Hungary. In 2017, Hungary's GDP grew by 4%. During the last two years of Orban's rule, unemployment in Hungary declined from 11.2% in 2010 to 3.8% in 2017. Orban’s government introduced a single 16% tax rate on profits, nationalized private pension funds. Fidesz has a lot of loyal media resources, which have become a means of Orban’s politicking. About 59% of Hungarian TV channels, Internet resources, and print media belong to businessmen who have close ties with the party of power. For 8 years of uninterrupted stay in power, Fidesz has limited freedom of speech in Hungary. Public news channels M1, M2 DUNA began to broadcast information in a pro-government interpretation, opposition Nepszabadsag newspaper was closed. There is an opinion that the Fidesz party uses political levers to reduce the influence of the opposition in Hungarian society: they have their own people in the Constitutional Court, opposition officials are fired, fines are being issued to opposition parties under the pretext of offenses, and the state budget is used to conduct a political campaign. Like President Vladimir Putin and United Russia, Viktor Orban and Fidesz established an authoritarian regime in favor of loyal oligarchs in Hungary. Orban expects to receive the votes of foreign Hungarians who live on the territory of other countries and who have a residence permit in Hungary. This is about 359 thousand people. Two thousand local Hungarians vote in Transcarpathia. However, the current Hungarian authorities have some weaknesses too. Orban's image is overshadowed by the recent corruption scandal involving his brother-in-law, businessman Sandor Tiborcz. His Elios Innovativ firm won an order for the supply of street lamps in Hungarian cities that were bought for EU money. In some cases, the cost of lamps was 56% higher than the market value. Perhaps it was rent-seeking behaviour. However, the Hungarian police closed the case in 2016 under the pretext of no violation of the law. The oligarchs associated with the Fidesz party took part in the construction of large infrastructure facilities. The contract for the construction of the sports ground in Felcsut, the village, where Orban was born, was signed by 120 firms of Meszaros. The European Commission requires clarification from the Hungarian government about the disappearance of the 283 million euros, allocated for the construction of the new subway line in Budapest (under the project by 1.7 billion euros). The most popular and influential opposition political force in these elections is the far right party "Jobbik" ("For Better Hungary"). This political force is supported by 18% of Hungarians. "Jobbik" took third place in terms of the number of seats in the Hungarian parliament (23 seats) in the 2014 parliamentary elections. Judging by the polls, the influence of ultranationalists in Hungarian society has grown, and they have a chance to move Socialist Party of Hungary to a third position. During the 2006 elections, the party "Jobbik" did not have enough votes to go to parliament. For Hungary, this is nonsense, because previously, socialists were the main opponent of Orban. "Jobbik" party exists since 2003, and it was initially associated with neo-fascism and xenophobia. In 2007-2009, Jobbik had a paramilitary organization called the Hungarian Guard that saw themselves as the main opponents of Jews and Gypsies. Subsequently, the views of the party leadership evolved. Their leader Gabor Vona believes that the "Jobbik" party needs to gain support for all the constructive forces in Hungary, and anti-Semitism and discrimination against the Roma are no longer acceptable. The party opposes the deployment of refugees and supports the tightening of the migration regime, even to the rejection of employment of migrant workers. The leader of the "Jobbik" faction in the Parliament, Zsiga-Karpat Daniel, is sure that it is necessary to promote the increase in the birth rate of native Hungarians within the country by carrying out programs for the construction of new housing and the development of households. In his opinion, it is necessary to abolish refugee camps in Hungary. 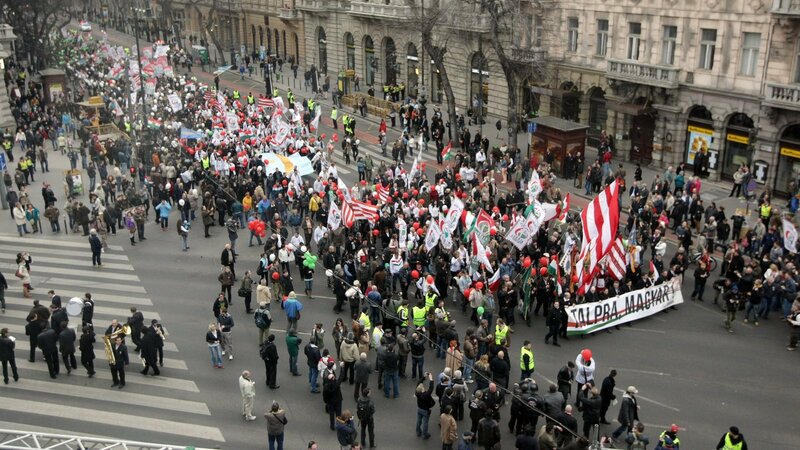 "Jobbik" stands for cooperation between the state and business, equalization of salaries, and reduction of emigration of Hungarians. The position of "Jobbik" in relation to European integration has changed too. Initially, the party supported the withdrawal from the EU. If previously burning of the flags of the European Union at rallies of the party was something usual, now Vona calls for deepening Hungary's integration into the EU and joining the Eurozone. The leader of "Jobbik" believes that there is no sense to leave the EU, because, against the backdrop of the migration crisis, it is possible to transform the integration education. "Jobbik" party is the main opposition to the current authorities in Hungary. 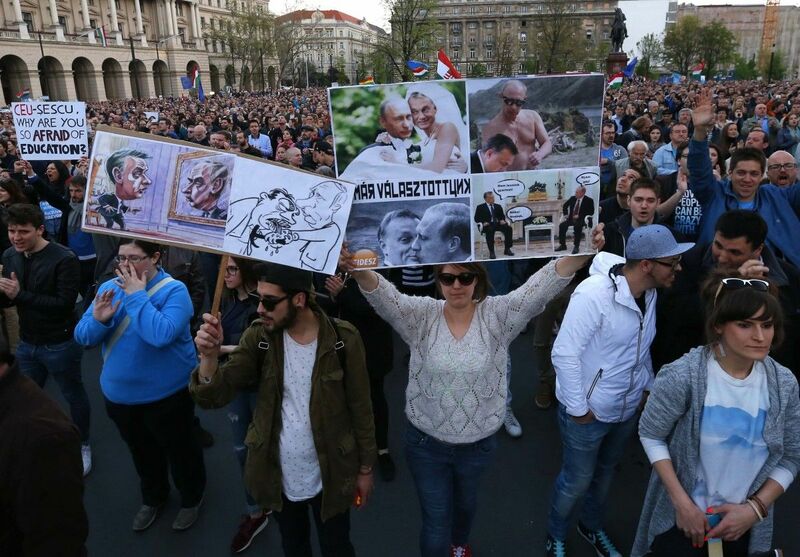 The ultra-nationalists criticize Orban for not a strict migration policy, and advocate the fight against corruption. "Jobbik" is trying to discredit Orban in every possible way. In January, there were rumors that the Hungarian government secretly placed 1,300 refugees, so the leader of the "Jobbik" party demanded explanations from Orban. "Jobbik" acts on the same electoral field as Fidesz and seeks to attract the most reactionary strata of Hungarian society, who are concerned about the refugee problem, but are disappointed in Orban's rule (because of corruption scandals among his entourage). If in December-March the ratings of Fidesz fell, the number of supporters of Jobbik on the contrary increased from 16% to 18%. Judging by the opinion polls, about 30% of Hungarian voters support Hungarian parties of a liberal-democratic nature. If the "Socialist Party of Hungary", the "Democratic Coalition", the "Momentum Movement", the Green Party "Politics Can Be Different," agreed on an alliance and went to the elections with a single list, they could defeat "Jobbik" in the election race. Nevertheless, the Hungarian liberals are divided. The Socialists are in opposition after their defeat at the 2010 parliamentary elections. The positions of the Socialist Party of Hungary weakened after the split in 2011 and the withdrawal of the political force of the Democratic Coalition, Ferenc Gyurcsany, former Socialist leader. “Momentum Movement” of Andras Fekete-Gyor is against an alliance with any of the parties. Fekete-Gyor became famous for his successful action in support of the voluntary refusal to host the Summer Olympic Games in Hungary in 2024. Now the Socialists occupy the third position in the pre-election race. They are supported by 14% of Hungarian voters. Only 7% of voters are ready to vote for the "Democratic coalition" and the Greens ones, and only 2% for the “Momentum Movement” party. Opposition parties are not very popular among voters because they hold a rather liberal position with regard to the refugees. The socialists and the greens do not agree with Fidesz on migration issues. At the same time, liberal parties that manage to get into parliament could play a decisive role in forming a coalition (if the parties of Fidesz and the Christian Democratic People's Party lack votes to form a parliamentary majority). In this case, Fidesz and the liberals would have to forget about their former hostility and join forces to leave "Jobbik" out of the coalition. The “lesser evil” for Ukraine is the preservation of the coalition of the Fidesz party and the Christian Democratic People's in the Hungarian parliament. Lately, Ukrainian-Hungarian relations are going through hard times. Bilateral relations overshadow the language dispute. Last year, the Hungarian authorities criticized Ukraine’s law on education, which stipulates teaching in Ukrainian in all educational institutions (including schools of local Hungarians). Fidesz supports the change of the territorial structure of Ukraine and calls for granting of autonomy to the Transcarpathian Hungarians. Despite the existing contradictions, the government of Orban continues to participate in anti-Russian sanctions, adheres to pragmatic relations with Europe and Russia. Strenthening of Jobbik’s positions is undesirable for Ukraine. The Hungarian far right advocates rapprochement with Russia, their observers attended a pseudo-referendum in Crimea. "Jobbik" recognized annexed Crimea as Russian and made claims to Transcarpathia. Radicals believe that all the territories of neighboring countries inhabited by ethnic Hungarians should be part of Hungary. The functionaries of "Jobbik" consider Ukraine an artificial state. In 2010-2014, the representative office of the "Jobbik" party of European MP Bela Kovacs, who visited the pseudo-referendum in Crimea and supported the annexation of the peninsula by Russia, functioned in the Transcarpathian town of Berehovo. Kovacs helped Transcarpathian Hungarians obtain a Hungarian passport, despite the fact that dual citizenship is prohibited by Ukrainian legislation. About 94 thousand Transcarpathian Hungarians have already received Hungarian citizenship under a simplified procedure. Hungarian-Ukrainian relations will deteriorate if "Jobbik" gets into the coalition. This party will lobby for the abolition of anti-Russian sanctions in the EU and stir up territorial disputes with Ukraine. Orban is less evil for Ukraine than the Hungarian ultranationalists. The fact that "Fidesz" and "Jobbik" compete with each other in the struggle for the electorate, and do not go to the elections as a united front, is beneficial for Ukraine. In March, the communities of the Hungarian culture of Transcarpathia, KMKSZ, which lobby the interests of the Fides Party, conducted an information campaign against ultranationalists from Jobbik. The ruling parties in Hungary would not benefit from the fact that the "Jobbik" party has joined the coalition. Otherwise, ultranationalists will promote Russia's influence in Hungary and facilitate external interference in the political processes of the country.